The performance appraisal process seems to be dreaded by everyone. It’s almost a cliche to hate on them at this point. Employees often are overwhelmed with too much feedback at once, or they’re left resenting a sparse performance appraisal. Meanwhile, managers struggle to complete all the performance appraisals they’re expected to diligently complete. Then, HR and People teams are left to look at hundreds of reviews to make sense of how the organization needs to change going forward based on employees ready for promotion, needing performance improvement plans, and more. No one is happy. This story plays out at companies all over the world with little changing year to year. It’s why some of the best companies are getting rid of their performance reviews entirely. Reflection – Zoom out of your day to day to look at the big picture of someone’s work and performance. Compensation – Having a set time to evaluate for and provide raises helps manage budgets and expectations. Advancement – Employees want a growth path at your company. Performance appraisals help identity when people are ready for a new role. Culling – Performance appraisals help identify underperformers who need to be turned around or let go for the sake of them and the rest of your team. Without a set time to reflect, it’s easy to let these critical actions slip, causing frustration to build across your organization. 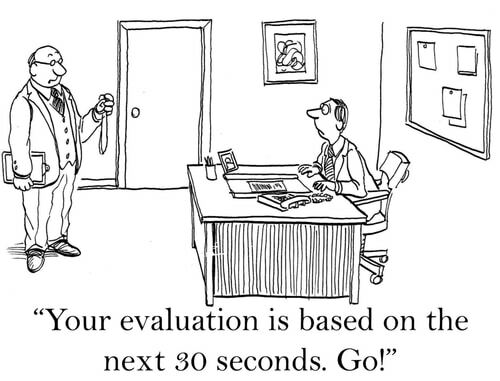 Even if you have them, too often, the performance appraisal process is rushed and not well prepared for. This leads to dread, resentment, and all the cliches around hate for reviews coming true. There has to be a better way. There is a better way. With a key new habit, you can improve your reviews before, during, and after them. And with this habit, you can have a greater impact than a change in questions or review approach alone can have. Here’s how. There are a number of ways to improve your performance appraisal process. Companies like Microsoft, and recently Amazon, are smartly moving away from stack ranking systems. Meanwhile, many companies are experimenting by changing the questions they ask. These can lead to incremental improvements, but often leave the root problem untreated. What do your managers do leading up to a review? How do they ensure their teams get better? Do your reviews have any ongoing meaning after they’re completed? These are the questions that great 1 on 1 meetings answer. By having a regular meeting time with each of your team members, a lot of the common problems your performance appraisal process faces get a lot easier. Here’s how. One of the biggest challenges with reviews is a manager’s memory. How well do you remember what happened last summer, when the winter holidays are around the corner? Too often, reviews are based on the negative things a manager can remember and anything good done in the last few weeks. That’s unfair to team members. It also incentivizes behavior to game it; work really hard right before a review and coast during less memorable times. Most importantly, it defeats the purpose of an annual performance appraisal process; it should reflect the entire time period it’s for, not just recent events. Imagine a world where when you start a performance appraisal process and you have all the notes you need to write your reviews. What a relief that would be! If you take notes in your 1 on 1 meetings, then that’s exactly what you have: a log of ongoing issues, discussions, and events that happened throughout the year. Wouldn’t that be so much easier, and effective, than desperately trying to jog your memory with limited clues? What comes up in your performance appraisal process should never be a surprise for a team member. Yet, if that’s the only time you give them feedback, it very well could be. Research from Harvard also finds that feedback, when tied to compensation discussions as part of your performance appraisal process, can trigger the “fight or flight” instinct. This causes a variety of physiological and mental responses that negatively impact your team member’s effectiveness. Good 1 on 1 meetings include discussing feedback. This allows you to tackle problems as they arise, instead of waiting. Also, if you’re regularly talking about issues, both positive praise, and areas for improvement, then there should be few surprises at review time. Even better, if you’re regularly talking about feedback throughout the year, the person’s performance appraisal can be a more positive experience; rather than talking about what needs to change, you can recap what has already changed. Building on existing momentum is much easier than trying to change a laundry list of issues raised all at once. Too often, the only time managers give any coaching and feedback is during the performance appraisal process. This creates a variety of problems. “It’s much easier to look everything over and say, “Overall, this is fine.” And it works because most employees are doing fine, and everyone would rather hear that they’re doing fine than hear that they are doing poorly. This watered-down review doesn’t help anyone improve. It can also build resentment; it’s fair for employees to ask if their manager cares or is paying attention at all to them and their work. Further, a variety of research from Psychology today shows that poorly done reviews can cause decreased productivity and loyalty by employees. This shouldn’t be surprising. 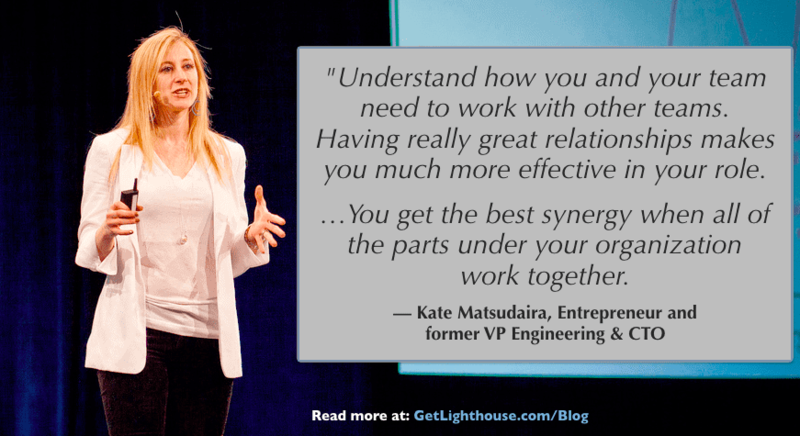 A key part of good 1 on 1 meetings is building rapport with your team. Having some ongoing time to check in how they’re doing and getting to know them personally a bit can make all the difference. Being approachable is a two-way street. If your team isn’t comfortable coming to you with problems, they’re also going to be uncomfortable when you come to them. Using regular 1 on 1 meetings to strengthen the relationships with your team will help them be more receptive to your feedback during and after their reviews. What happens when a review is complete? Often, it’s submitted to HR and they start their process to determine raises and bonuses. And now you’re done for 6 to 12 months. What a relief. If all you do is give feedback in your performance appraisal process and hope it gets better in a year, don’t be surprised if nothing changes. It can also cause resentment if your team starts to feel like reviews are a broken record every year. 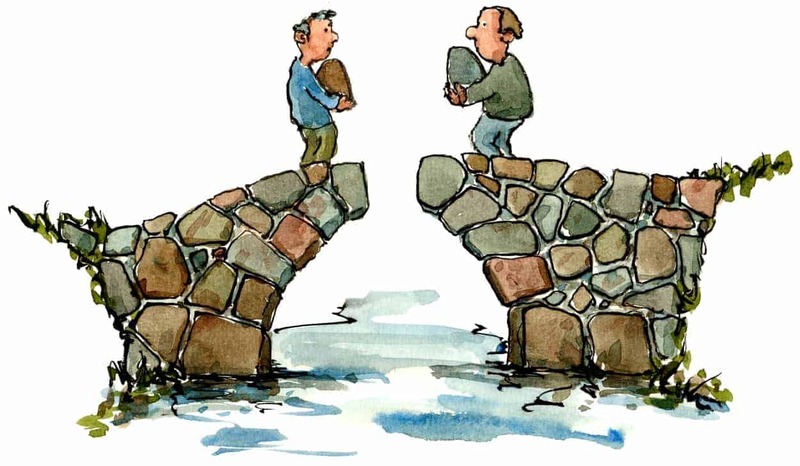 If you haven’t been working together on these issues, then there’s a good chance they will show up again and again. To make the most of your performance appraisal process, and get the full value of what you’re evaluating people on, you need to apply the progress principle. All these discussions keeps the focus on ongoing improvement and progress. 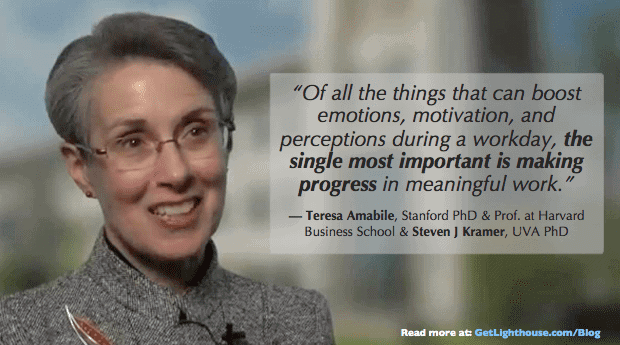 This is great for you, your company, and as we’ve learned from Amabile & Kramer, your employee’s happiness. Good managers are multipliers for their people. Unfortunately, poor managers don’t just fail to grow their people, they cause unhappiness that kill good teams. “They wanted to “look good.” That’s the primary thing they cared about, not building an organization, not making their subordinates better, not Doing The Right Thing. When the focus of a manager’s efforts is on a once a year performance appraisal process, it’s easy for bad managers to hide. By focusing on what it takes to “look good” in these reviews, they’re often able to game the system. Left in their wake are neglected, frustrated teams that may look okay in a once a year snapshot, but are filled with problems that will lead to employee turnover, under-developed talent, and unhappy teams. It’s very difficult to game regular 1 on 1 meetings. Bad managers generally cancel and avoid them. Even if they have them, they’ll either stop being a bad manager because of them, or be badly outpaced by what good managers do in them. Essential to creating a great team, effective 1 on 1s help you keep your best people. It provides regular time to get their input and help them improve. Ambitious people are also hungry to grow as study after study shows. A review helps them see how they have or have not been growing. Don’t be the manager that made no progress with them or you’ll lose them. Equally important, you can turn around underperformers with 1 on 1s by continuing to work with them on issues post review (learn how to here). 1 on 1 meetings are a great way to continue key performance discussions year round without the stress of pay and bonuses. Instead, you can focus on what really matters: creating a great, high performing team that meets the goals you set together. Great performance is a moving target. 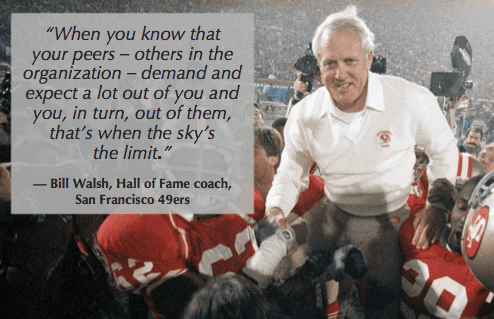 Having a great team requires ongoing effort. A once a year discussion lacks the nuance and regular progress required to keep your best people engaged and to improve your underperformers. 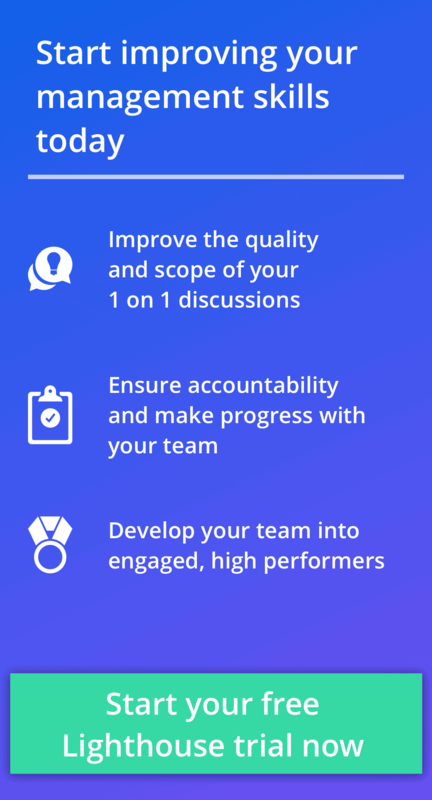 Regular 1 on 1 meetings are the perfect way to ensure you and the other managers at your company are doing everything they can before, and after, your performance appraisal process to build great teams. Want to learn how to have amazing 1 on 1s? Curious what to do to get them started? Don’t miss our Webinar this Thursday. 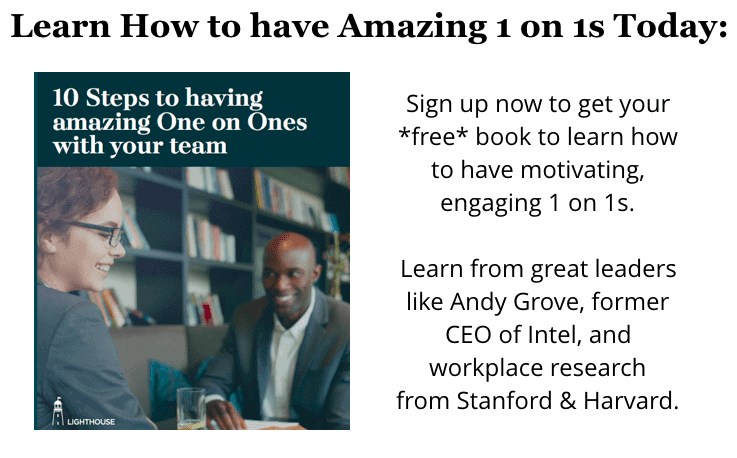 Whether you’re brand new to 1 on 1 meetings, or a veteran looking to tune up your tactics, sign up now for our webinar, “How to use 1 on 1 meetings to prevent turnover and drive top performance” this Thursday at 9:00am PST.